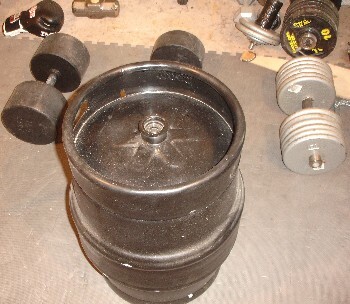 If you are interested in odd object lifting, a keg is one of the least expensiveÂ objects that you’ll find. Most liquor stores will gladly sellÂ an empty keg for the standard $10 deposit fee. Liquor stores that are located near large college campuses are perhaps the best place to look. As a graduateÂ of the University of Connecticut, I knew there were alwaysÂ kegsÂ in the area. A few years ago, I took the ride to my old school onÂ a Monday morning. Monday is the best day for kegs, asÂ the college kids are oftenÂ returning kegs from weekend parties. I stopped at the one of the main liquor stores and asked if I could purchase a few empties. The store owner looked at me like I was from another planet, but gladly agreed. I had pick of the litter. I walked around the side of the store and found what had to be 20 or more empties. For thirty bucks, I had three fine empties. 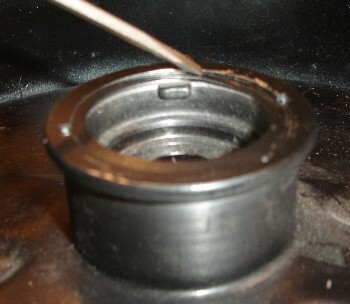 You can pop the spring out withÂ a small screwdriver. Once the spring is out, you’ll turn the stem until the tabs are aligned and thenÂ pull out the stem. You can then rinse out the inside and fill as much water as you need for lifting. It is somewhat of a pain to open and then close the keg, but you’ll get used to it with a few tries. Below are a few videosÂ from Youtube that do a much better job at describing the simple process. The two videos show unique variations for opening the keg. And here is another link for those interested in opening a sankey keg. Fortunately, you won’t need to be certified in anything to lift your keg. It’s really quite simple. You can clean and press it, shoulder it, squat with it, bear hug itÂ and carry for time, load and unload the keg repetitively toÂ a raised platform, and so on. As the water sloshes back and forth, you can expect a unique (and fun) challenge. Use your imagination and you’ll think of many more exercises. Which kegs did you buy, and how heavy are they when empty? Exellent! I was useing mine empty, and now that I see how easy it is to fill, I can put that baby to use. Wickedess! I took mine apart over the weekend, but I was sprayed with beer though. Good times and thanks for the links. When I tried to open mine on Friday, I realized there was quite a bit of beer still in there. I guess training will have to wait til Monday. Cheers!!! Ross, thanks for this video/article. I just wanted to ask as a curious question. Could you ‘farmers walk’ this keg. I have not bought one yet but i can see with the keg that there are holes around the top rim so maybe, inotrducing some towels or some sort of carrrying belt would work (wrapping the towel aroudn the rim hole), and then fill it with water and your ready to go? It’s a little late for this guy but if anybody else comes across this the answer is “yes”. The handles are designed to be held with gloves though and even then many handle designs will hurt. Interesting guide, I think I’ll see if I can get one of these. Will probably need to weigh it.